Signs of spring! The giraffes were out. 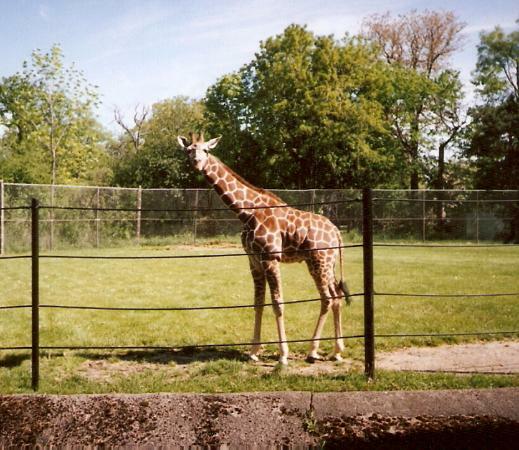 I told Howard I was going to make note of the giraffe and he said: "You'd be sticking your neck out." Ha, ha! But I am doing it anyway. I could not take a picture from my car in the heat of the moment so I used that picture up above from Trip Advisor, of a giraffe at the Buffalo Zoo. It is cool how the Buffalo Zoo is in the city, right on a well-traveled street corner, so it is not unusual to round the corner and see a giraffe. Other animals, too! Once I saw a rhinoceros. I just happened to have just the right view into the zoo. That is a most excellent thing, when you are driving down an ordinary city street and can see a rhinoceros! It was just standing there two-dimensional, like an animal cracker. Anyway, that was one sign of spring, seeing the giraffe. Another was, I saw a freighter steaming into the harbor the other day. That is a summer sight! And one more thing, the greatest sign of all. Yesterday morning I went outside to take out the garbage -- just me taking out the garbage is a sign of spring -- and I heard the unmistakable voice that means spring. The voice from next door. "You son of a pup," it said. It was the guy from next door who cannot stop swearing! His voice was quiet as if he were warming up. But it was distinct! I heard him! Surely now spring is here to stay. We may now hear Pennario playing "Rustles of Spring."